Special as it seems, Special A is just one of those Rom-Coms that will get you hooked right from the beginning. It features an interesting range of characters and an engaging storyline. 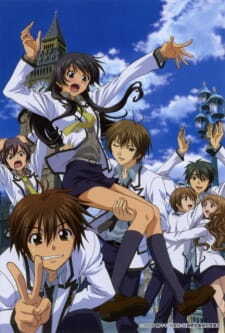 Hikari Hanazono has always been second to Kei Takishima. When they were six years old, their pro-wrestling loving fathers introduced them to each other. Assuming that she was the best in wrestling, young Hikari challenged Kei to a wrestling match only to be thoroughly defeated by him. Special A is one of those anime that you think you would find boring but ends up really good towards the end. This is what I felt about Special A. Before I started watching I thought it was going to be boring, but I was pleasantly surprised. Special A has one of the more linear plot-lines that an average anime would have. However, the wide range of characters along with the conflict between the main protagonist and antagonist, makes the story that much more exciting and entertaining. The art did take a while to get used to. The first thing you would notice is how stretched the characters looked, but somehow, you will manage to get used to it. After a while, you will start to notice how nice the art has been painted throughout the whole series. The facial expressions of the ever-changing moods of the characters are quite spectacularly brought out. You will come to love the art style of the anime gradually as you continue to watch. The voice acting was well recorded. Especially the many arguments and challenges the two main characters throw at each other is priceless. The soundtracks used throughout the anime as well as the background music used for the last episode was really well put. Characters were definitely well loved yet hated at the same time. Facepalming moments are truly aplenty here. Other times, you will love the character, other times you just hate them so much you want to shout out loud. All these different emotions definitely indicate a well thought out anime cast. It inhibits your emotions and expressions towards each and every character. Overall I really enjoyed this anime. It was an exciting story from start to end. Not once did I felt bored or tired of the cast. I would recommend this anime to anyone that likes a slice of comedy in their life. Linear but interesting. As you progress towards to the end of the series, things will get quite interesting and emotional. Well brought out by the artists, although it may take time to get used to it. Well voiced characters and expressions throughout the whole series. Wide range of characters make this an enjoyable anime to watch. I enjoyed it really much. The comedy element was really brought out even though the main characters were always fighting one another. It's a pretty good anime to have a laugh at. This will definitely keep you up all night.